If you have a D-Link DI-604 Rev E. Router with Firmware 3.36 or greater (3.52 is recommended) and want to learn how to set up DNS updates follow the guide below. WARNING: Do not use firmware version 3.53, No-IP DDNS support is NOT built into it. Go to the “Tools” tab at the top and then click on “Misc” on the left hand side. Scroll down to the “Dynamic DNS” section. Newer versions of D-Link’s firmware may look different. If you are trying to just update the IP of your root domain. Enter a dash “-” for the host. 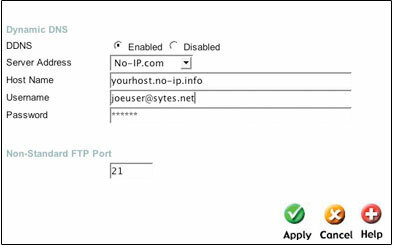 For example, to update mydomain.com I would put -.mydomain.com in the Host Name field. Newer Firmware is available for the DI-604 models. Please upgrade to the 3.52 or greater firmware by going to D-Link’s website. Be sure that DDNS is enabled on the page,then click apply and you’re done. You may want to cycle the power on your cable/dsl modem and router to force an update. Finally check your log. Go to the “status” tab on the 604 and click the log button from time to time just to make sure everything is setup correctly.